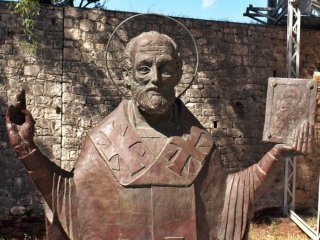 Saint Nicholes History: Saint Nicholas is the common name for Nicholas of Myra, a Roman Catholic Saint he was also a Bishop of Myra, in Lycia, part of now days Turkey. based on the many miracles attributed to his intercession, he is called Nicholas the Wonderworker. 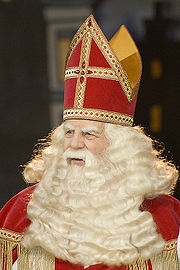 He had a reputation for secret gift-giving, such as putting coins in the shoes of those who left them out for him, and thus became the model for Santa Claus, the English name comes from the Dutch word Sinterklaas. Saint Nicholas reputation evolved among the faithful. In 1087, his relics were furtively translated to Bari, in southern Italy; because of this he is also known as Nicholas of Bari.historicaly Saint Nicholas is revered among Catholics. Saint Nicholas is the patron saint of sailors, merchants, archers, children, and students. He is also the patron saint of Amsterdam Barranquilla, Bari, Barranquilla, Beit Jala, Liverpool and Siggiewi . In 1809, the New-York Historical Society convened and retroactively named Sancte Claus the patron saint of Nieuw Amsterdam, the Dutch name for New York City. Also a patron of the Varangian Guard of the Byzantine emperors, who protected his relics in Bari. For helping the poor,Saint Nicholas is the patron saint of pawnbrokers; the three gold balls traditionally hung outside a pawnshop symbolize the three sacks of gold. People then began to suspect that he was behind a large number of other anonymous gifts to the poor, using the inheritance from his wealthy parents. After he died, people in the region continued to give to the poor anonymously, and such gifts are still often attributed to St. Nicholas. Died December 6, 346 A.D.